If you have a website or blog, you will want to rank high in search engines (google, bing, etc) i.e you want your blog or website to show up in at least the first page when someone conducts a search on particular keywords or key phrase(s). This has about 90% dependence on the links you build. This means that you have about 90% more chance to be in top 10 search results on search engines. Simply put, link building is the process of getting or securing a link from another website which points to your website or blog. Those links are called backlinks. This link can point to your homepage or to a particular blog post or article. Links to a post or article are never too much. In fact, the higher the links to a post or site, the higher the chances of that post particular post or site to rank high in search results. Link building is important for backlinks and SEO. The importance mentioned above are in no way all the benefits you can derive from link building. There are much more benefits but I only mentioned those so you can understand why you need link building. Your ability to convert or make money from your blog visits or visitors. The last one is bold because many bloggers monetizetheir blogs one way or the other which can be through affiliate marketing or other ways. If you have many and good links to your blog, you have made blog monetization an easy thing. More visits equals more impressions and potential click on adverts you may place on your site (read more about that here). How do I effectively build links? When building links, one should take it as if they are starting a business. As there are many reasons why some businessesfail before they get started, so there are reasons why your link building dream may be a failure before it starts. Get links from websites or blogs related to your niche. When looking for those links (finding backlinks) try to get links from websites or blogs that has a bit high domain authority. This will tell search engines that you are ready to roll the big boys. As much as it is important to get links from external websites and blogs (sites or blog you do not own), it is equally important to start your link building within your website or blog. This process is called internal link building. 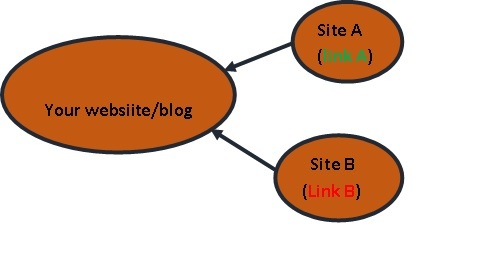 This is the process of linking one page of your blog or website to other pages on the same blog. As you can see, I have linked some pages on my blog to this page using anchor text. The links you see point to other pages on my blog and I have used them in places that they should be used. Always make sure that your links are put in the right places. Using internal linking just anywhere in a post without any need for it in that particular place turns your readers off reading the post. For example, if you talking about internetmarketing in a particular post and you want to link another page like taking your offline business online to that post, you should make sure those links are a bit related to that particular post or the paragraph that has the links is explaining something that is relevant to the post. That is exactly what I just did in the paragraph above. The two links on the paragraph above are not necessarily related to this post but they are required in the example. Link building is necessary for blogs and websites but it should be used keeping in mind that low quality links are not too healthy for your blogs. Internal linking should also be employed and used in the right places. Thanks for writing such a good article on backlinks. It is not bendy in backlinks. People always try direct method but most of time these trick don't works. Your tips are helpful for the person to make good backlinks for their websites or blog. This content is so valuable and surely unique that people are happy and really helpful for them. any pressure from your side, neither in the form of request nor hint or reminder in any ways.